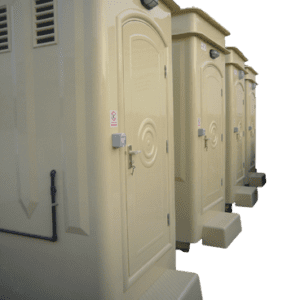 GRP Portable toilets is one of the traditional / conventional products which is widely used in Construction and Oil field industry due to its light weight structure and low pricing and ready availability with water and waste tanks. Eastern type W/C is also available. GRP Toilets are widely used in UAE region as it is most reliable when it comes to the harsh climate, water usage, spray hose (Shattaf), lights and fan, when compared to the European made Plastic Toilets. Both has the advantages though. Ask for GRP Shower Cabins also.